Jane Pristach is the executive director of Norfinch Care Community and winner of the 2017 Ontario Senior Achievement Award. Jane Pristach has always looked out for those who need her help. Jane was only 12 when her younger brother contracted Polio. The disease left him in a wheelchair, which she pushed to school every day for four years, protecting him from bullies. 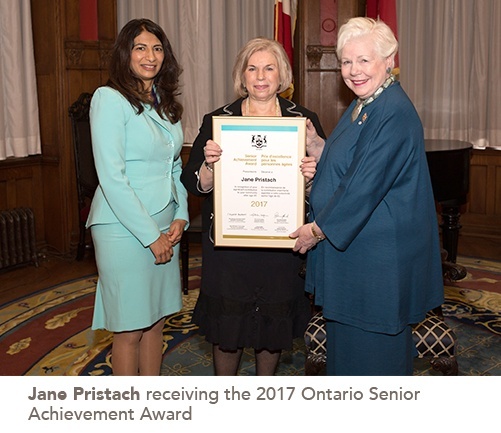 In late November 2017, Jane was a recipient of the 2017 Ontario Senior Achievement Award for her work as the executive director at Norfinch Care Community in North York. Jane was 65 years old when she began working at Norfinch as a director of care, having been called out of retirement to take the position. Jane had not applied for a position, and was touring Paris, France when she got the call. She told them she would be back in Canada in a few days. Shortly after that, she got the job as a director of care at Norfinch Care Community in North York. Five years later, in 2010, she became the executive director. During elections, Jane often invites Ministers of Parliament to Norfinch to speak and encourage residents to get out and vote. Many residents, Jane said, are still perfectly capable of voting, and so they should be able to. She’s also circulated petitions asking the government to increase the funding for long-term care, and is constantly trying to find new ways to improve the lives of those she serves. At Norfinch, everyone believes that Jane knows everything going on at the community. The opinion is so strongly held that some residents and family were convinced Jane would discover the plans for her surprise party before it happened. 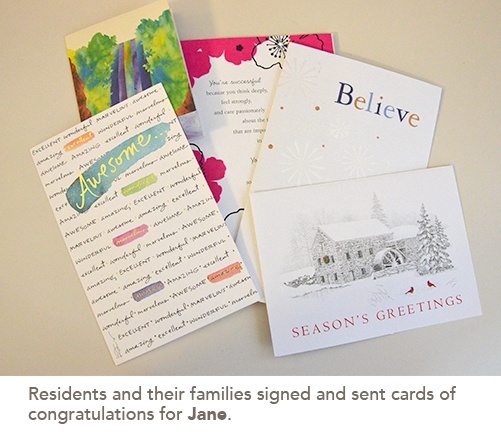 Jane was surprised by her party, and honoured by the cards presented to her by the resident and family councils.